The APP Tour starts this weekend on Maui, but good luck picking the winners. UPDATE: That’s a wrap on Maui. Check out the 2017 APP World Tour Maui Pro-Am RESULTS to see how it all went down. The 2017 APP Tour kicks off this weekend, with the Maui Pro-Am marking the first of six racing stops for the Waterman League’s much hyped new global circuit that replaces the old Stand Up World Series. A strong lineup of talent has descended on Maui for this five-star event, with the men’s side in particular looking set to be uber-competitive. The current top three on the World Rankings – Connor Baxter, Michael Booth and Travis Grant – are all set to compete, and they’ll be joined by many other top-ranked athletes including Mo Freitas, Casper Steinfath, James Casey, Jake Jensen, Arthur Arutkin, Leo Nika, Matt Nottage, Toby Cracknell, Bernd Roediger, Kenny Kaneko, Lincoln Dews, Giorgio Gomez, Slater Trout, Josh Riccio and Kody Kerbox. The women’s field will be a lot smaller, however we will see three of the world’s top four ranked ladies in action – Candice Appleby, Sonni Honscheid and Fiona Wylde – along with world number seven Terrene Black and a few local dark horses. This highly competitive lineup of talent – the men’s event will score just over 50% on the Race Index, the first time a Waterman League event has ever broken the magic 5-star barrier – along with unpredictable conditions make the 2017 Maui Pro-Am an incredibly difficult event to predict. 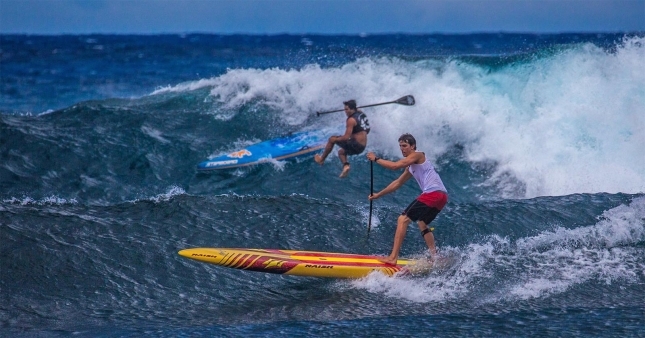 The original event format called for a classic Maliko run along with a beach race in and out through the waves at Ho’okipa, with combined results determining the overall event champions. If that plan holds then it’ll be very, very hard to match Connor–the world number one is unbeatable when the Maliko run is firing, and a victory there would put him in a good position to claim the overall. However the winds on Maui have been swirling all week, and rumour has it the downwinder may be scrapped as the forecast calls for near dead flat conditions on Sunday. Organisers are apparently waiting til the last minute to decide, but if there are no trades for a downwind run then the distance race will become a flat water long course at Kanaha Beach. That will instantly create a much more even playing field, which in turn makes it that much more difficult to predict. So for once I’m not even going to bother with Boss Man’s Bold Predictions. Instead you can just sit back and enjoy the action on the webcast Saturday and Sunday, then check back on Monday morning to see how the first big race of the year impacts the 2017 World Rankings leaderboard.